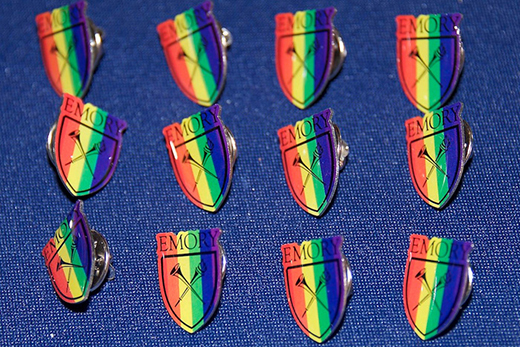 Emory's annual Pride Awards honor students, alumni, staff and faculty members who represent the Office of LGBT Life’s mission of creating an affirming and just campus environment. The Office of Lesbian, Gay, Bisexual and Transgender (LGBT) Life Advisory Committee has announced the winners of the annual Pride Awards. The recipients are students, alumni, staff and faculty members who represent the Office of LGBT Life’s mission of creating an affirming and just campus environment. The awards will be presented at the Pride Awards celebration on March 2 at 6:30 p.m. at the Miller-Ward Alumni House. Awards include the Outstanding Transgender Advocate Award, Outstanding Ally of the Year Award, Chesnut LGBT Person of the Year Award, Fierce Leadership Award, Alum of the Year Award and the GALA Leadership Award. In addition to the award winners, student leaders who received support from the J. Michael Aycock Leadership Development Fund and D. Daniel D. Adame Student Leadership Fund will be recognized at the Pride Awards. Finally, 2017 graduates will be recognized for their academic achievements with lavender diplomas and rainbow graduation cords. The event is free and open to the public. Returning alumni and graduating students are invited to a special pre-Pride Awards reception starting at 5:30 p.m. Please register here. Everett B. Arthur is a graduating Emory Law student who has spent his time on campus working tirelessly to make the Law School trans inclusive. He has served on Emory’s Preferred Name Policy focus groups, as an executive board member of Emory OUTLaw, and advised the Law School’s Career Services office on best practices for trans inclusion. Outside of Emory, Arthur has worked as a legal intern for the Transgender Law Center at Southerners on New Ground, has been featured in the HBO documentary "Suited," and has a forthcoming publication "Why Law Schools Need to Be Trans Inclusive." With a hope of increasing visibility and resources for the LGBT community, Jill Camper has supported a variety of initiatives at Emory Law, positioning herself as a devoted ally. Her advocacy has shown in her efforts in creating a Diversity and Inclusion Coalition at Emory Law, supporting the mission and tackling funding issues for Emory OUTLaw, and working to bring speakers whose experiences address intersectional issues. Additionally, over the years Camper has worked closely with the Office of LGBT Life as safe space facilitator and supporter of the Emory Pride Drag Show. As a co-president of the Queer/Trans Collaborative at Rollins, Marcel Foster has enlivened the queer community on Rollins’ campus as an active and humble trailblazer. Leading efforts for Pride Week at Rollins, the communications initiative for the diversity and inclusion strategic plan, and the LGBTQ Grad Coalition, Foster has worked to create inclusive spaces for queer and trans graduate students. Holly Lewis has spent her time at Emory working diligently as a doctoral and medical school student. Both inside and out of the classroom, Lewis has sought to promote inclusion for LGBT students. Through asking students their preferred names and pronouns in use in the classroom to contributing to Emory Pride’s annual Drag Show, Lewis has worked to inspire the people in her sphere of influence to be more aware of the issues facing the LGBT community. A senior Economics major, Sonia Chinai is a co-president of the Sorority and Fraternity Pride Alliance, and has worked to create a community of support for LGBT and ally members of Emory’s sororities and fraternities. Giving voice to those students, her work has contributed to improving the organizations membership numbers six-fold. She is working on creating pathways to connect LGBT first year students with LGBT fraternity and sorority members. As an advocate and resource for students both while at Emory and beyond his time on campus, Gerry Lowrey has contributed to the legacy of the LGBT community at Emory. After earning his PhD, Lowrey served as associate dean for Campus Life, director of athletics and recreation, and senior director of the Emory Alumni Association. Throughout his time, he helped to create and support LGBT student groups, and still finds time today to advocate for students. For more information, contact Danielle M. Bruce-Steele at dmsteel@emory.edu.